Best Audio Editor - Audacity! Audacity has long been hailed as one of the best audio editors in the world being an open source software it draws more support from normal users. Audacity has the most basic user interface. Audacity allows the user to edit, trim, crop, cut, paste and so much more to the user to edit the song as you wish. Audacity was founded by a college student who now works for Google but still maintains Audacity. 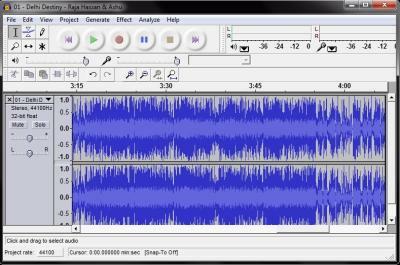 Audacity is a very powerful audio editor, it can make the audio files smaller in size if the user wants by just reducing the quality of the audio. It can remove unwanted noise from the audio for fine refinement of the audio. Audacity can also be used in your language by just downloading a ZIP file which has all the worlds top languages. Audacity won the SourceForge.net 2007 Community Choice Award for Best Project for Multimedia for being the 6th ,most popular tool with 63 million downloads! The ability to make precise adjustments to the audio's speed while maintaining pitch, in order to synchronize it with video, run for the right length of time, etc.